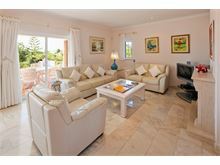 Casa Pleiades, named after the stellar constellation, certainly lives up to its name being a star choice for a villa holiday in this very popular resort. 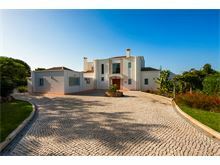 The substantial property, situated at the end of a quiet cul-de-sac, in a superb large private plot, yet is within 20 minutes walk of the shops, bars and restaurants in Carvoeiro. 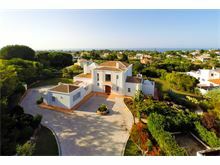 This modern villa offers plenty of space for 6, with three en suite bedrooms and a fantastic terrace overlooking the pools and with distant sea views. Gated driveway leads up to the villa entrance. Hallway with guest cloakroom. Corridor leads to twin bedroom with ensuite shower room and doors to terrace. 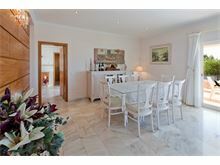 Open plan living/dining area, doors to terrace, TV and DVD. 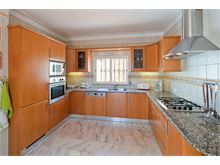 Fully equipped kitchen with dishwasher and microwave. Upstairs to large master double bedroom with split mattresses on a double base, doors to terrace with sea views and full en suite bathroom with separate walk in shower. Further twin bedroom with doors to terrace and en suite shower room. Maid service 5 times per week, laundry by arrangement. Air conditioning and pool heating are available at extra cost, if required. Casa Pleiades was brilliant for our family holiday. 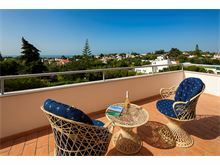 Quiet and private but only a few minutes drive from a wide range of shops and restaurants in Carvoeiro. 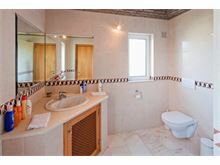 The bedrooms and bathrooms were spacious and comfortable, the pool ideal size and temperature and the balcony had a great view out for sunsets over the sea. A wonderful stress free visit for all ages. The villa was nice and clean, lovely size pool, maid five times a week. Very good location, easy to get any where but, would recommend getting a car as its a it long to walk into the town etc but, we did use the taxi service twice and they were very good. 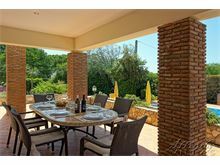 An excellent villa in spacious grounds. The accommodation is luxurious and stylish. 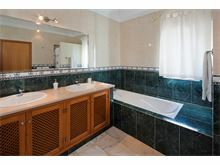 Great for couples with three generous ensuites. It's well equipped and very clean. The pool is of a good size and not overlooked. The villa is close enough to Carvoeiro to walk but taxis are frequent and cheap (and speedy!). 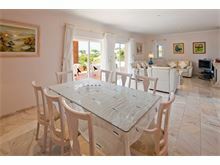 Carvoeiro has some very good restaurants to eat out in and for self catering the supermarket is not far way. Affinity Villas provided an efficient service. 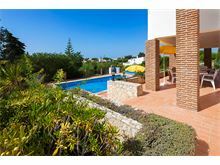 Beautiful villa situated in mature gardens a residential part of Carvoeiro. Good sized swimming pool. Well equipped. Fantastic views from the upper level. 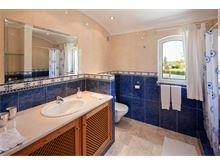 A great villa which was spotlessly clean, set on a large plot. Great kitchen with all the utensils you need. Lovely view from the upstairs balcony, including the sea. Large swimming pool which was well worth the extra money to have heated for the kids. A taxi into the centre of Carvoeiro only cost 6-7 Euro which we found reasonable. Another fabulous holiday thanks to all at Affinity. A lovely house with a fantastic pool. Lovely villa. Quiet location with beautiful sea view. Very comfortable. Beautiful villa. Walking distance of restaurant. We always enjoy our stay and look forward to returning.